Wild Water is a slot game from Net Entertainment, set in deep, intimidating sea, surrounding the Pacific Islands. 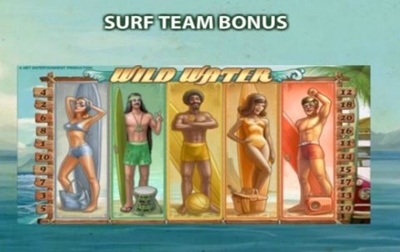 It’s a slot that uses a 1960’s theme, and we’re talking the classic, stereotypical surfer’s look here; everything from the way the reels look, to the music, symbol-design, and even the game’s loading screen is designed with this theme in mind… and we’ve got to say; Net Entertainment pull it off really well. The game looks super cool, and you’ll see the left-hand-side of the screen’s background featuring a sea, and – what appears to be – a series of quite rough waves. The right-hand-side of the background shows a classic VW Camper Van, and the reels and reel-structure is made using wooden-looking poles. Even better, Wild Water can be enjoyed by all types of players, thanks to the mobile-optimized version of the game. Accessible to play on almost all types of mobile phones and tablets available today, the mobile version of Wild Water is fast, glitch-free, and doesn’t require any additional software to load. Now, back to the game itself; you’ll notice – as soon as the game loads up – that there’s a distinct lack of symbols on the reels; in fact, there’s just five, and these are different surfers, distinguishable by the colour of the outfit they’re wearing. There’s also a wild symbol, which takes the form of a Shark. If you manage to land all of the five surfers on the reels, you’ll win a huge 200X prize, right away. Each surfer must take up an entire reel to him/herself, and while rare, this is a great base-game feature, as it often lands when you don’t even realize you’re looking for it. 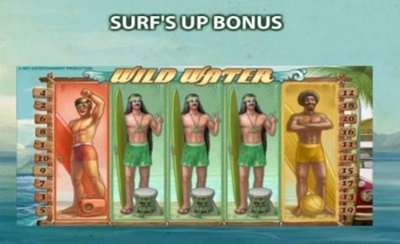 Similar to the Surf Team Bonus, the Surf’s Up Bonus pays if you land any mixture of the five surfers on the reels. In other words, if you manage to cover all five reels in just surfers – no scatter symbols or wilds – you’ll win a prize of 20X; not the best award in the world, but thanks to the regularity at which it lands, it’s a nice balance-booster. 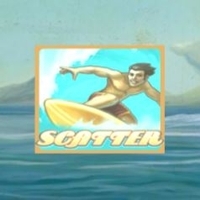 If you manage to land three or more of the scatter symbols – shown in Wild Water as a surfer riding a wave – you’ll enter the free-spins feature, and depending on how many scatter symbols you land, you can win anywhere from ten, to sixty free-spins. During the free-spins bonus, the wild symbol – the shark – becomes stacked, when he lands in a position that makes a winning pay line. While it can be frustrating to land him, thinking you’ve got a wild reel, it’s important to remember it’s only when he is already part of a winning pay line that he’ll become fully-wild; just something to remember.